Economics and religion usually do not talk to one another. 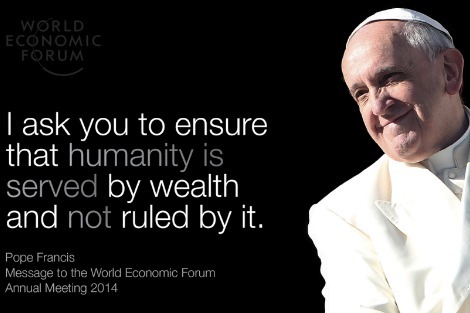 So Pope Francis' message to the World Economic Forum at Davos aroused some interest. It was brief. It developed the Catholic understanding that government and business economic actions should be governed, not by trust in the benign working of the free market, but by care for the good of the whole human community. Coincidentally in Australia Social Services Minister Kevin Andrews announced a review of welfare payments. It is instructive to reflect on the review in the light of the Pope's approach. In the context of your meeting, I wish to emphasise the importance that the various political and economic sectors have in promoting an inclusive approach which takes into consideration the dignity of every human person and the common good. I'm referring to a concern that ought to shape every political and economic decision, but which at times seems to be little more than an afterthought. Those working in these sectors have a precise responsibility towards others, particularly those who are most frail, weak and vulnerable. This vision of equality demands that the most disadvantaged in society can enjoy the conditions that the better-off members of society would regard as essential for themselves to live with human dignity. The Australian proposal to review welfare payments is in itself compatible with this Catholic vision. Its goal of helping people to find work and so connect with society is laudable. Regular review is essential to guarantee that government resources are directed to the frail, weak and vulnerable. Over time needs change and policies have unintended consequences. The review of course will not be judged by the goals set for it but by how it enables those who are frail, weak and vulnerable to live in a way that respects their human dignity and removes the obstacles to finding employment that face those able to work. The current system certainly has limitations. The Newstart allowance needs to be increased. It is indexed to the cost of living, whereas the disability allowance is indexed to the average wage that rises more rapidly. Those living on it struggle to shelter and feed themselves and their families. The difficulty facing the review, and the reason why it has alarmed many commentators, lies in the difficulty of reconciling the two goals enunciated by the minister. It is to reduce the cost of welfare payments in the light of the claimed impossibility of funding it in future. The second goal, seen as the means to reducing the burden, is to encourage the unemployed to find work. These two goals may be compatible in a rising economy when employment is growing and resources are available to assist people to enter or rejoin the work force. But in coming years the unemployment rate seems likely to grow. The Government's decision not to subsidise businesses such as General Motors, and presumably Toyota, will bring abrupt and unplanned closures with the resultant pressure on employment by suppliers and local businesses. The increased unemployment will leave more people reliant on Newstart and disability. It is difficult to see how expenditure on welfare can be reduced by people finding work at a time when large numbers of employees are losing their jobs. The difficulty for the review in cutting costs is exacerbated because expensive programs like pensions and paid maternity leave from which better-off Australians also benefit have been exempted from review. So there are reasonable grounds for fear that the review will focus simply on cutting the welfare budget. It will not raise the allowances of people who are unemployed, will make it more difficult for them to live with dignity, and so extend the inequality between them and working Australians. In previous times of financial stringency governments have cut costs by imposing on recipients of benefits such onerous conditions that the most disadvantaged will not be able to meet them. Their loss of benefits is then justified by fanning public scorn for 'dole bludgers'. The poor then must beg and live in constant humiliation. It is to be hoped that the review will not lead to such a result and that the measures taken embody Pope Francis' Catholic insistence that they are 'directed to a better distribution of wealth, the creation of sources of employment and an integral promotion of the poor which goes beyond a simple welfare mentality'. Unfortunately, Andrew, the Pope's vision is not shared by the vast majority of people who don't believe in his God ( including, it seems, if practice is any indicator of belief perhaps 80% of nominal Catholics). Equitable distribution of the wealth earned by the hard work of others was a major cause of the failure of communism and will also spell failure for the Pope's vision. Perhaps more would be achieved by restoring belief in God than re-awakening a system which smacks of the tried and failed principles of communism. Pope Francis has the where-with-all through his exemplary example to help people see God in others and thus address the issue of voluntary welfare to our fellow men. Recommending a previously failed economic solution is not what this civilisation which no longer espouses the Judeo-Christian ethic will accept. Believers and non-believers alike seem to accept and listen to this Pope, however, and therein lies his great power. Pity if he alienates himself from this great opportunity, through what the wealth generating world from which welfare can be paid sees as a failed communist ideal. I think the Pope has more chance of influencing finance ministers with his comments quoted in Andrew's article than 'restoring belief in God' as recommended by John Frawley. Fortunately '80% of nominal Catholics' do not identify God with the Church, and so non-attendance in liturgy is not an indicator of non-belief in God. Welfare for the poor in the Pope's comments was never part of communism. Under the two major forms of applied communism - Leninist or Maoist, livelihood for the poorer classes was based on a complete re-structuring of society to a levelling of social classes to a very low common denominator except for the Party leaders. The Pope's comments reflect socialism, not communism. And socialism before Marx was based as much on the the Gospel as on Enlightenment humanism. British socialism started in the chapels of the non-Conformist Christian tradesmen, and Israeli socialism of the 1950s & 1960s (pre-Likud era) is based on the Jewish concept of tikkun olam - healing the world. While I have not researched it fully, I believe Scandinavian socialism, like the British tradition, is based largely on Protestant Christianity. Please do not equate socialism with Marxist communism. Similarly, John Frawley, if one were to point out the failures of both secular and nominal Christian society to uphold the ideals of church teachings on sexual morality, would you suggest the Pope try a different approach rather than risk facing the reality that both believers and non-believers will continue blindly, oblivious to the Golden Rule - which is basically what underpins both economic and sexual morality. "The Government's decision not to subsidise businesses such as General Motors, and presumably Toyota, will bring abrupt and unplanned closures with the resultant pressure on employment by suppliers and local businesses. The increased unemployment will leave more people reliant on Newstart and disability." The previous Governments (Labor and Coalition) did subsidise the car industry for decades and still Mitsubishi and Ford either closed their manufacturing plants or announced their closure. I think it is fair to say that all Governments tried their hardest to keep these industries in Australia, however high production costs and a small market failed to make economic sense to manufacturers. We still have “payroll taxes” in Australia which is in reality a fine for employing people. John Frawley, can you explain to me why 'voluntary welfare' is more desirable than that funded by the state through taxation? I take exception to your opening sentence Fr Andrew - "Economics and religion usually do not talk to one another." I think you should have hoisted your colours up the mast in a far more honest way with a sentence such as "I'm jumping on the 'let's get Abbott et al so when they deliver real solutions for all Australians, I can say I told them" bandwagon. And I dont't think Pope Francis would appreciate being used for cheap political shots. You could have addressed the issue without the implied questioning of Abbott's or Andrew's religious commitments. Beat, there are subsidies and subsidies. Some, like tariffs and those to the car industry, and before it the whitegoods industry, and before that the textile clothing and footwear industries, are overt and quantifiable. Others, like the opportunity to dig up non-renewable resources and flog them without compensating the nation adequately for the diminution of its assets are covert and not as easily quantifiable. Until we recognise that free-for-all mining has grossly inflated the value of our currency and thereby the level playing field for our added-value industries, we will continue to experience the curse of resources. An excellent piece on an important topic. Francis is looming as a truly inspired leader, in many fronts. I hope only that that inspiration translates into, and wakes up, the archaic Vatican hierarchy. It was a previous Pope who said that unbridled capitalism was as evil as communism. Popes are not necessarily well-informed on economics, but they are necessarily well-informed on evil. An excellent article. I don't think the Pope is promoting any kind of socialism but a vision - which I don't consider unachievable - of a humane, mutually supportive society which is in full accord with what is recorded of Jesus in the Gospels. In some ways I think modern economists are a little like witch doctors: many of their recommendations just don't work. It is easy to critique Francis for being "impractical" but I think politicians, business leaders and economists have often been as useful as all the King's horses and all the King's men in putting together a mutually supportive society as he envisaged. Whether Coalition or Labor in this country, or whatever complexion elsewhere, I think politicians and their tame advisers would do well to heed what the Pope said. He was not enunciating a detailed program but speaking about the general way society should go. It would be up to politicians and business people to flush out the details. He is presenting a credible and achievable challenge. It would be all too easy to ignore it as "impractical". I do not fundamentally disagree with your article, Andrew, but I am concerned that the tone of Eureka St seems to be much more critical of this government than the last one. When single mother's payments were cut last year by Gillard's government, there did not seem to the criticism that this government has incurred by having what is, after all, only a review. The same has happened with the refugee issue, where both governments were equally inhumane but the Abbott has attracted much more criticism in this magazine. A little impartiality, please. It is alright for people supporting big-government policies, but we have inherited a large deficit from the previous Labor/Greens government. Thank God we now have Tony Abbott, Kevin Andrews and the rest of the cabinet who are trying to bring sanity back into the Federal government. I don't think anyone has said they support 'big-government policies' Ron nor that there might be a 'deficit' (as distinct from debt) problem. Aren't they simply questioning the government's priorities in terms of where the burden is to fall and/or the effectiveness of various possible actions? Unlimited greed is a given. Various creeds and cultures manage it or promote it differently. The Buddah for example had the three anathamata as Greed, Hatred and Revenge. Luther and Calvin seem to have made greed more than acceptable by noting that the elect would be noticeable by their blessings in this life by their prosperity. So go for it you good devote things. Often even here you read of people who ammassed wealth by their hard work. As if that justifies it. But it was not always thus, ask people who worked for them, ask their families or their victims. But it is good to hear something frm the Vatican which adds genuine motivation to what many of us would think is just a fair thing rather than barbarism. It would be wonderful if the premise of John Frawley's response to Andrew Hamilton - that financial trickle down from the wealth of the financially and commercially successful - actually worked. Almost thirty years of evidence throughout the world, especially in poorer countries, shows that this doesn't and hasn't worked and in relief. As to Ron Cini's view that all the woes of the Australian economy are down to recent Labor governments, plainly his memory is short. Unparalleled tax receipts during the Howard years were substantially returned in welfare payments, much of it "middle class" welfare, that left little to show in the national bank account for a period of continuous growth unrivaled in Australian history. When the financial crisis hit in 2008, you may recall that the measures of the Rudd government had support from the Coalition or they wouldn't have become law. Fr Mick Mac Andrew may I move to your parish please? Michael K, you are right. Like with the communist system, the aquisitiveness of the capitalist system equally does not work to the benefit of all men. My premise is that unless men see each other as does Pope Francis, namely, see Christ in each other, (my understanding of man created in God's image)no economic system is likely to cure the woes of the disadvantaged unless implemented by force as communism tried to do and as a result of which it failed. Better to help men see God in each other as the starting point, something which this cracker of a Pope certainly does. An excellent article Fr. Hamilton! It is a pity most of the comments indicate that most people have not read it carefully and do not fully understand Pope Francis's message. The real issue is that Australian society and its governments have developed a philosophy and culture of total adherence to capitalism with very little government influence and regulation. Most people in Australia want to pay less, if any, tax, which means that the government will have less money to spend on education, health and welfare services. Most Australian people are happy with a U.S.A. type of society where individuals are responsible for every aspect of their lives and disadvantaged people are ignored. Ginger Meggs I feel the current pope has failed as far to promote one value of highest importance, I mean”honesty”. Our society has become a society based on cheating, lying and stealing. It is dishonest for out politicians to pay themselves massive salaries and superannuation, it is cheating for board members of public companies to pay themselves multi-million dollar rewards. The same level of dishonesty is used by many companies to mislead (often on the border of legality). Welfare cheats, people smugglers, rip-off contractors, shonky mining companies, insurance fraudsters, inside traders, shonky “welfare organisations”, shop lifters, shonky car dealers and burglars cost our society many Billion Dollars a year. Without honesty there can be no respect for others and there is no dignity for the dishonest. Only a society based on honesty can be a fair society. We can have the best laws, but without honesty everything becomes corrupt. I wonder why we are allowing our governments all around the world to "frack" and destroy our water, to create rotten food, to have banks that clearly rip us off and a host of other nasty things. I wonder if it is partly because the New Age teaches us that there is no evil? If we believe there is no evil, then of course we will do nothing to stop it - heavens above, we might not even see it, or simply say it is in the "Divine Plan". Folks, these people are KILLING us and destroying the planet. Let's wake up, and actually take some action! Amen Beat, I couldn't agree more with you on most of what you said. It would be nice to see our politicians and other 'leaders' set the pace in terms of honesty, but I'm not holding my breath. I was simply trying to say that one reason why our manufacturing costs appear high is that our currency is grossly inflated as a result of our resources boom in which public non-renewable assets are being flogged off with negligible return to the nation and no thought for the future. It's time to make 'The Glugs of Gosh' (by C.J. Dennis) compulsory reading. ...to see God in each other? If goats and sheep see Christ in their neighbour Matthew 25:31-46. it can’t be just about seeing Christ in our neighbour. To love your neighbour as ‘yourself’ is intrinsically seeing him in ‘yourself’. But how ? By realizing we are loving breathing creatures one day- worm meat the next. Death is inevitable. Unless we come to this realization first, this crucifixion of the self, we are delusional if we think we know Christ- understand his teaching and actively love our neighbours. I like Tim Collier’s quote on the other page. What does God require of us? To do justice, and to love kindness and to walk humbly with our God (and also in another's shoes) because it reminded me of the nonfiction book Black Like Me by journalist John Howard Griffin first published in 1961. Griffin was a white native of Dallas, Texas and the book describes his six-week experience travelling on Greyhound buses (occasionally hitchhiking) throughout the racially segregated states of Louisiana, Mississippi, Alabama, and Georgia passing as a black man. Sepia Magazine financed the project in exchange for the right to print the account first as a series of articles.Griffin kept a journal of his experiences; the 188-page diary was the genesis of the book. At the time of the book's writing in 1959, race relations in America were particularly strained and Griffin aimed to explain the difficulties that black people faced in certain areas. Under the care of a doctor, Griffin artificially darkened his skin to pass as a black man. In 1964, a film version of Black Like Me starring James Whitmore was produced. Robert Bonazzi subsequently published the book *Man in the Mirror: John Howard Griffin and the Story of Black Like Me. Wiki - Michael Jackson’s inspiration for ‘Man in the Mirror’ song.